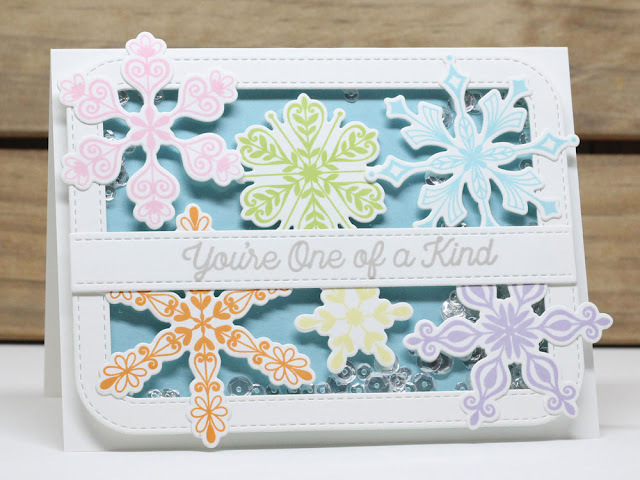 My card today features the new Simply Snowflakes stamp set and Die-namics, along with the super cool Stitched Rounded Rectangle Frame. I stamped them in a colorful array and adhered them to the frame and acetate, creating a shaker card. These products and many more will be available for purchase in just 22 hours, on November at 10 PM EST. Be sure to check out the MFT Blog to see what the rest of the team has come up with today. Awesome shaker card. Love all those snowflakes. Thank you for sharing.